That is the premise of the Suzuki Method. Its creator, violinist Shinichi Suzuki, was an accomplished violin player who left his native Japan to study in Germany, where he noticed children easily pick up new languages while adults like him struggled. This led to the development of his method, which promotes a very early introduction to music in children, who study how the instrument works, what good music sounds like, and how they can create the notes, tonality and articulation of what they hear on their own (very small) instruments. Only after several years of study “by ear” do students get introduced to reading written music. 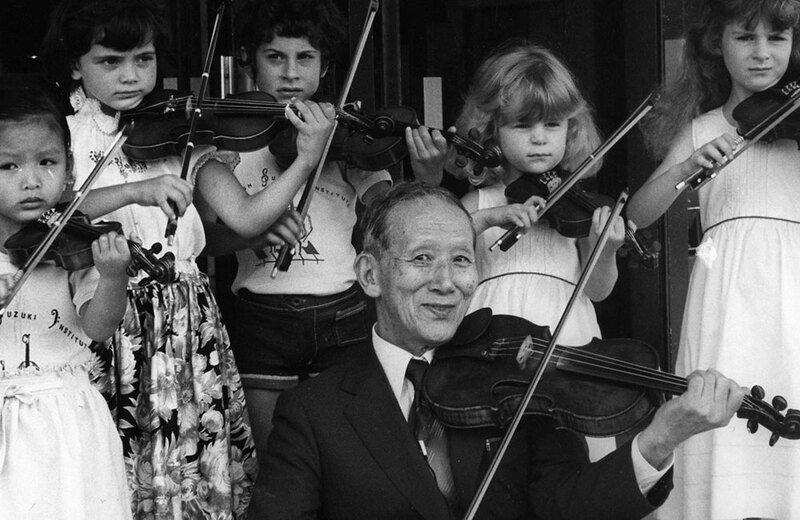 The Suzuki Method is not just for violinists. One can learn to play by way of these learning principles on the cello, viola, bass, flute, guitar, harp, piano, organ, recorder, mandolin, guitar, trumpet and even voice. Former students of the Suzuki Method, now accomplished musicians, include Hilary Hahn, Leila Josefewicz, William Preucil, Jr., Rachel Barton, Jennifer Koh, Nickolas Kendall, James Stern, Frank Almond, Brian Lewis, David Perry, Rebecca McFaul, and Russell Falstad. Note that some begin with Suzuki but may continue their education by other methodologies before completing the Suzuki repertoire. The local violin shop would likely be a good resource for locating a reputable Suzuki teacher. Odds are, a violin dealer already provides Suzuki-sized instruments for other students learning the Method. Exposure: Daily exposure to music, specifically from the Suzuki repertoire as well as other music. 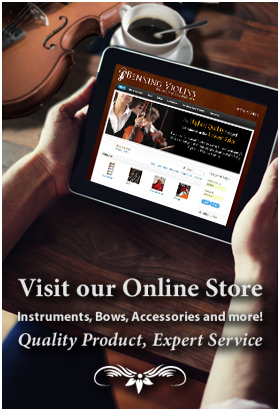 Begin early: Suzuki is the reason the modern violin maker builds the tiniest fractionalized instruments (as small as 1/32), as students begin as young as age 3. Parents as co-instructors: Mothers and fathers are expected to attend each lesson, and to provide a positive, nurturing environment for the young student. Non-competitive: The Method is one that encourages auditioning for groups and performance, but with less emphasis on competition and more on participation. Strict repertoire: Suzuki believed that technique, musicianship and style are developed through a series of pieces that build on the piece that came before it. Reading music: After basic playing skills are mastered, the student graduates to reading music. Adherents to the Suzuki Method emphasize it’s not strictly for children on a path to careers in music, although that’s obviously a possibility. But it could be a foundation for artistry in many forms. Actress Sarah Jessica Parker studied by the method as a child, prior to being cast in the star role of “Little Orphan Annie” and later roles as an adult. The Method may be too taxing for some parents. But for those who might enjoy the journey of learning to create beautiful music with their children, it might be just the right thing.